Mike Brown's Planets: Europa is hot! 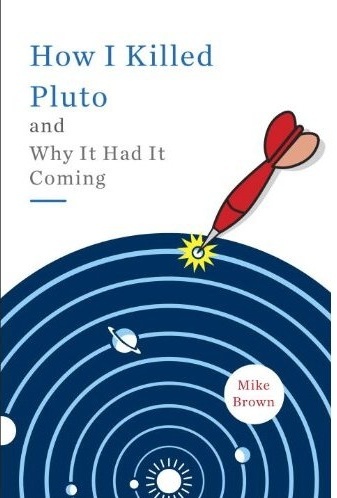 A thoroughly sporadic column from astronomer Mike Brown on space and science, planets and dwarf planets, the sun, the moon, the stars, and the joys and frustrations of search, discovery, and life. With a family in tow. Or towing. Or perhaps in mutual orbit. Europa is hot right now. With the planning for the Europa Clipper mission underway and talk even of a lander, scientists are paying more attention to the little icy satellite than ever. Much of the recent excitement has been a discussion of the now-you-see-them-now-you-don't plumes that might be jetting material from the interior ocean. Such a possibility would be quite exciting indeed, as it would allow us to understand the interior conditions of Europa without having to do something crazy like dig a hole through the ice. But the plumes have been on the tantalizing edge of detection so far. Today another tantalizing bit of evidence came out. One of the possible plumes was possibly seen again in the same place. The new detection, like all of the old ones, is still just on the verge of being believable. I personally remain skeptical, but I would call it skeptical but hopeful rather than skeptical and dismissive. While I have no extra insight into the plumes, one of the really interesting things about the potentially-repeating plume on Europa is where it is seen. As mentioned today, old data from the Galileo spacecraft suggests that the possible source location of the possible plume is possibly a spot on Europa that is hotter than it should be. Hotter than it should be! This is very exciting, because it would both suggest that liquid water is probably close to the surface, but it is also something that I can actually address. For the past year my graduate student Samantha Trumbo and I, along with our colleague Bryan Butler and NRAO have been mapping the surface temperature of Europa from the new ALMA millimeter telescope in Chile. So is there really a hot spot on Europa???????? The answer is complicated. To know if a spot on Europa is hotter than it should be we have to figure out how hot it should be. This requires a lot of work and is part of Samantha's Ph.D. thesis. We don't have all of the answers yet, but inspired by the news today she took a careful look at that spot on Europa. This is all still very preliminary work. We would normally wait to show results until our analyses were complete. But with the excitement of a potentially plume and hot spot we though we would give a quick example of what our data from ALMA show. The recent Hubble Space Telescope (HST) observations of Europa show a recurring anomaly that may be consistent with a water vapor plume. The scientists have located the most likely surface source region for this feature and found that it coincides with a potential hotspot seen in temperature data from the Galileo orbiter. If this hotspot is real, this could be strong evidence that the HST anomaly is really due to geologic activity on Europa, rather than some less interesting cause. We've observed Europa using the Atacama Large Millimeter/submillimeter Array (ALMA) and obtained complete temperature maps of the surface. These can also be used to look for hotspots that may be indicative of geologic activity or even plumes. However, the thermal maps are strongly influenced by the surface properties of Europa, particularly in how well the different surface materials absorb light, radiate heat, and resist changes in temperature. Therefore, in order to look for hotspots, we developed a computer model to try to account for these variables. The model calculates the absorption and re-radiation of sunlight, as well as the day-to-night cycle of heat flow into and out of Europa’s near-surface layers. This allows us to create model ALMA images that we can compare to our observations in search of anomalies. One of our observations captures the inferred source region of the potential plume signature captured by HST. When we compare this observation to the results of our thermal model, the region does not stand out as anomalously warm. In fact, it is a little colder than our model predicts. Critically, though, we look at Europa during Europa's daytime (because we can't do otherwise). The Galileo spacecraft, however, could sit behind Europa and look at its night side, where the surface should have cooled. While most of the surface has cooled, that one spot hasn't cooled very much. The area near the purported plume source, which also includes the large Pwyll impact crater, stands out as much warmer on the night side than the model predicts. 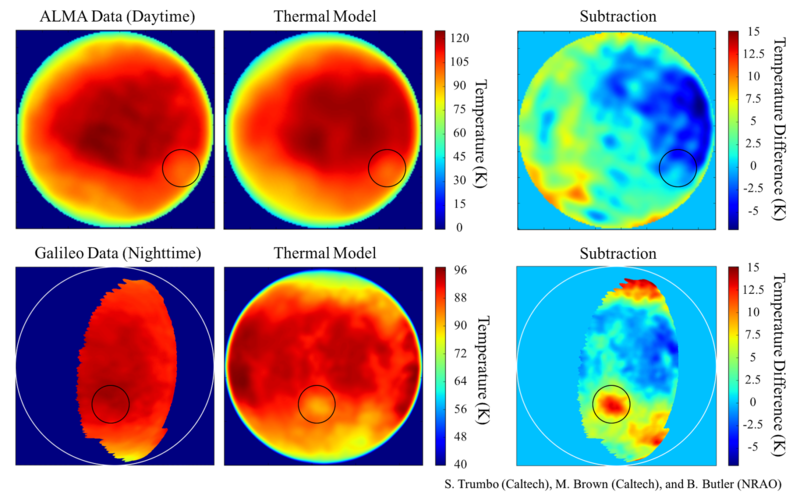 The top row shows temperatures on Europa measured from ALMA compared to our expectations ("thermal model"). The circle at about the 4 o'clock location is the alleged hot spot. The far left shows the difference between the measurements and our expectations. As you can see, our computer model is not yet perfect, but it does a pretty good of predicting the temperature of Europa. The bottom row shows the same computer model but now comparing to the Galileo nightside data (note the change in temperature scale; its a lot colder at night). Again, the match is not too bad except that in one place the nightside temperature is ~15 degrees C hotter than it should be. That is a huge difference. In fact, the dayside and nightside temperature at that one spot are nearly the same. Why? Maybe there is hot material just beneath the surface. Maybe the material retains heat better, like hot pavement on a cool night. Further analysis should answer the question. Something that is warm at night is definitely a hot spot, but why is it hot? It’s possible that spatial variations in the surface properties could cause localized areas to appear anomalous at night. Indeed, the Galileo team noted that the region in the vicinity of Europa’s large Pwyll crater was hotter than expected and suggested that a large thermal inertia may be to blame, although they did not rule out the possibility of subsurface heating. Thermal inertia is essentially the ability to resist temperature change. Sand, for instance, has a low thermal inertia; it gets very hot during the day, but quickly becomes cold at night. Rocks, on the other hand, have a much higher thermal inertia; they can remain warm well into the evening. Just knowing that the spot is hot at night can't tell you why. But the good news is that the combination of daytime temperature and nighttime temperature will allow us to answer the question. We plan on refining our model to see if it is possible to explain this hotspot in the Galileo data with variations in thermal properties of the surface materials, but at this time we cannot rule out the intriguing possibility of subsurface or plume activity. We will also use our data to search for other potential hotspots, which may not have been visible during the HST observations. Stay tuned for more excitement. Sam has kept me informed about these fascinating results. Question? Might the new data from Enceladus cause any changes to the instrumentation on the Clipper Mission? which one is the Clipper Mission? is that a different than JUICE? Are they both going to launch in the early 20's? yeah, Clipper is NASA/Europa, JUICE is ESA/the other moons, basically. Every time an announcement is made about the possibility of life outside of Earth is met with apathy, because I have become jaded over such things. No longer is the possibility of something good enough to grab my attention. People have been discussing this topic for millennia, but I need direct evidence to get me excited. On Earth, smokestacks on the beds of our oceans where not a single faint ray of sunlight is present, are teaming with life, but Earth's great aquatic wildernesses are replete with life of many sorts. Algae grows within ice in Antarctica, but so what. Life may be fickle, it may not know what it wants or needs and scientists seem to be chasing chimaeras, perhaps to keep astronomy not just relevant, but exciting. A couple of months ago it was Enceladus that was spotlighted for its possible suitability for life because tidal heating may bring its frozen ocean to a liquid state beneath an ice sheet. Have we discovered whales swimming under the ice sheet, probably not; whales are mammals (at least they are, here on Mercury...I mean Earth) that need to surface to breath air...perhaps they are whale sharks? Or is life present on Titan, Ganymede, Callisto...Ceres, hummm...do not get your hopes up. Even if living bacteria was discovered on another world, it would be a significant find, but chasing plumes of vapor, mist or lollipops seems like chasing shadowy dreams. I tend to be similarly cynical. The recent Enceladus discovery of H2 is more significant though, I would say, because we now know we could pick up terrestrial microbes and place them inside of Enceladas and they would survive and reproduce. That has never been known before, so even in the face of my general cynicism I find that pretty exciting! Hi,Is the Europa hot spot at Pwyll? Why does the thermal model put a cold spot on that location? In the data, the difference from the surrounding area seems rather small.